Stunning Keisha: Smooth Attack Cat in Action! Today’s PhotoHunt challenge is Smooth. With all the hustle and bustle of the holiday season, I couldn’t really concentrate on this theme. I settled on how Smooth Pop’s hand is; a perfect target to be attacked. I started Christmas morning by attacking Pop’s smooth hand as he foolishly got between my and my nip truffles. I’ll be reviewing them in the coming weeks. They were very smooth indeed. Here’s the video. Notice how smooth my moves are. You can also view it on my YouTube channel. 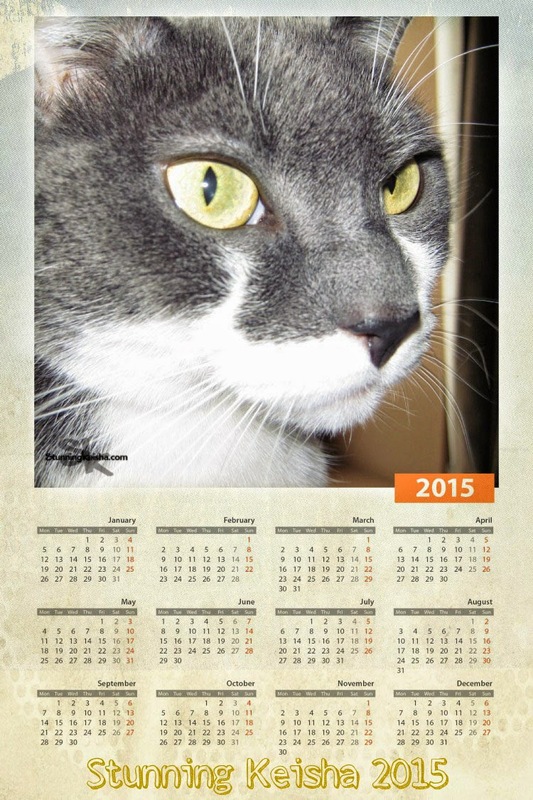 Next week starts 2015, so I thought the perfect piece de resistance for the Caturday Art Blog Hop hosted by Athena and Marie would be a calendar for the coming year. I couldn’t find the calendar template I really wanted so I made due with the the one on photofunia. It was boring and white so I jazzed it up just a bit with a Papyrus filter from PicMonkey that I applied to everything but my stunning picture. I left the image large so you could biggify it to print it out. I want to send some healing purrz to a special mancat, Flynn, who’s feeling poorly and was at the v.e.t. yesterday. Hope he gets to feeling better and eating soon. Love ya, Flynn. I don’t wanna have to put the bitey on you. Wow, CK, you are a little attached to those nip truffles, aren't you? I'm purring lots for Flynn too. Don't get between a girl and her nip truffles, huh? Very smooth indeed. Love the calendar. We are praying for Flynn to get better. That nip make you nip the hand CK! We are sure purring from dear Flynn. And your calendar looks totally stunning! Happy Caturday! Wow, CK, did you think your Pop was going to eat your truffles? Great attack skills, though. Love your calendar. We are purring for Flynn, too. That's a cool calendar. We are purring and praying for Flynn as well. Well, I guess we know never to touch your nip CK! You have deadly attack skills! I have told mum to print your calendar for me and put it by my ham-mick so I can gaze at you all day long. I wouldn't let anybody else put the bitey on me, but you can come and do it any time. 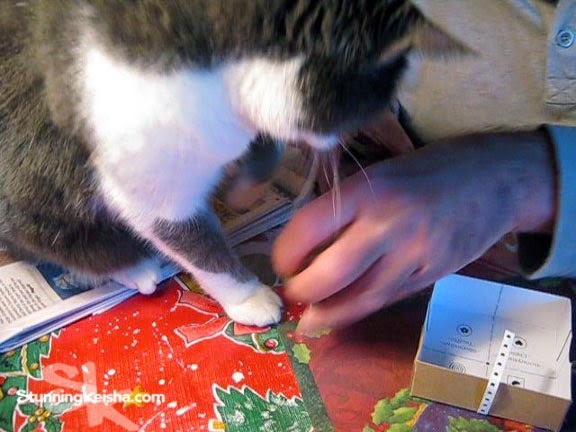 Looks like you had little helper wrapping gifts. Hope 2015 is a smooth going. Gasp! Not Pop's hand! CK - that is the ultimate sin - Pop is your main guy remember? Whew! You got downright vicious there CK. Whoa - they must be some awesome truffles. Gorgeous calendar, CK! As stunning as you. ...that's what Glogirly does to Gloman when he tries to sneak one of her truffles. Nip truffles? Wow.......sounds simply STUNNING! Dang, CK. You surely are smooth in that video. But what the heck was Pop thinking, putting his hand there? Your calendar looks beautiful and stunning ... just like you! Yes, definitely purring and praying for Flynn. Love the video! When will the peeps learn not to get between us and our nip! Hey, I saw Sunday that Noko Marie (mini CK at PAWS) has been adopted! http://www.shelter-cats.com/2014/11/noko-marie/ Yea!!! Great video, poor Pop's hand. Guess that will teach Pop to mess with your stuff. Thanks for the nice purrs and prayers for Joe. He needs them. Girl friend! You have what it takes!! Wow, you put the lightening-fast moves on your dad. I hope he's ok. I've never heard of nip truffles. I saw the action on You Tube!! It's made the Staff look at me a bit sideways, ya know, kind of wondering!! I like to keep her on tenterhooks. Will I, Won't I? Hehehehe!! GASP! I love Flynn and would always treat him with respect. I said I’d loan him out if he’d agreed to it.